My first experience with co-authoring was with the April Barker and the “What About Momma’s House?” series. Honestly, I was too chicken to write the first book by myself. I thought people would read more into it because we’d recently lost my beloved mother-in-law. Though there were some similarities between the Porter family and my own, the reader feedback quickly confirmed that many families struggle through misunderstandings and disagreements following the death of a matriarch. When I first talked to April about the idea, she was elated. Of course, I was, too. April (who had dubbed me her writing mentor) is a great writer and we both looked forward to bouncing ideas off of each other. The idea of holding each other accountable never really crossed my mind, though I did feel some degree of self-imposed pressure to keep the ball moving as we wrote. We started with prayer and a chapter outline. Since this book was going to be told in third person with one main character (Katrice) and two secondary characters (Montrel and Patrick aka “Junior”), it was easy to divvy up the responsibilities. We were shooting for a 30,000 word novella with 20 chapters, so each chapter needed to be about 1500 words. The way the outline fell, she’d write a few chapters from Katrice’s POV, and then I’d write the next two – from from Montrel, the next from Patrick. We ended up writing about 10 chapters each. The story was told sequentially, so we fed off of each other, one chapter after another, in order to make it seamless. 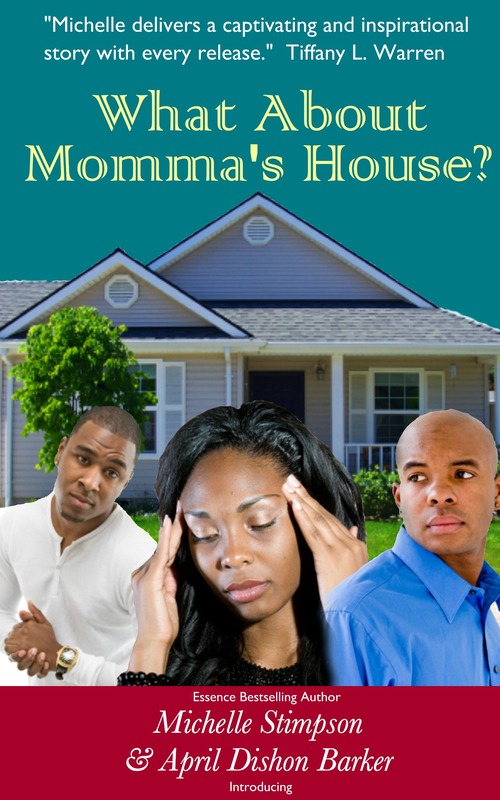 We started writing in late July, 2013, and What About Momma’s House? was published September 2 of that same year. The book was well-received by readers (THANK YOU! ), and as soon as reviews started coming in, we knew we needed a sequel. 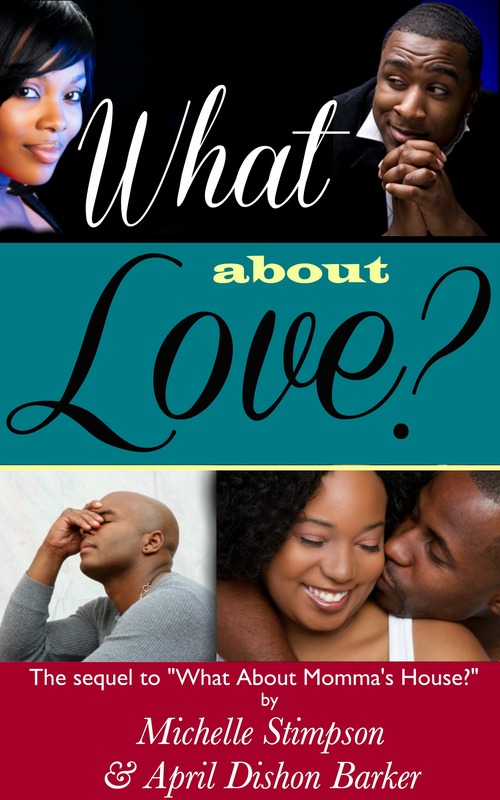 We planned a second book, What About Love?, and published December 7. Finally, What About Tomorrow? was released March 24, 2014. 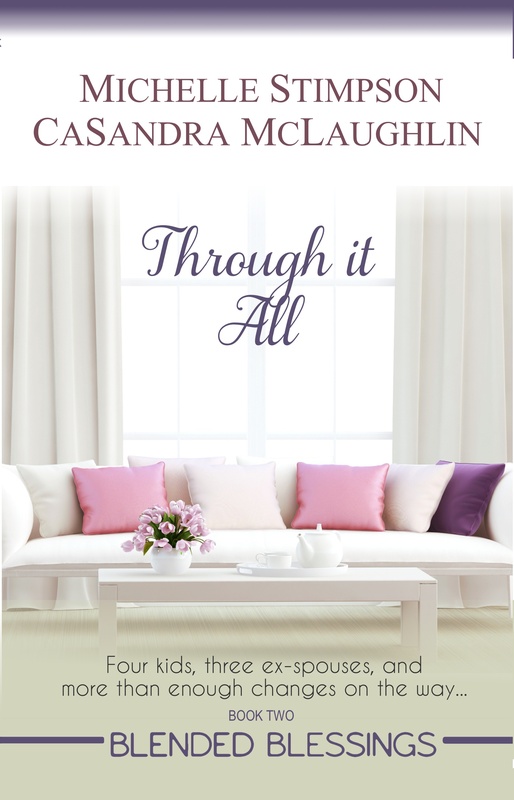 This year, I’ve begun the process of co-authoring again with CaSandra McLaughlin. I’ve known “Cassie” for about five years now through her involvement with her church club. I also listen to her radio show when I happen to be up and about in the mornings. She’s got a bright, bubbly personality, she devours Christian fiction books, and she’s somewhat “up” on the latest TV drama, so I knew she’d stretch me! Most of that stuff isn’t even in the book, but the process is what matters! In that hour and a half, we prayed and got direction for the series. The big difference between this one and the previous one, however, was the viewpoint. We were going first-person for the whole book, which meant the voice had to be consistent or readers might get confused. Thankfully, CaSandra and I have similar backgrounds and dialect, so it hasn’t been as big of a challenge as I thought it would be. We brainstormed on January 10 and I wrote the outline the next day. We followed the 20-chapter outline, for the most part. I wrote the first three chapters, then Cassie wrote the next three, and so on. 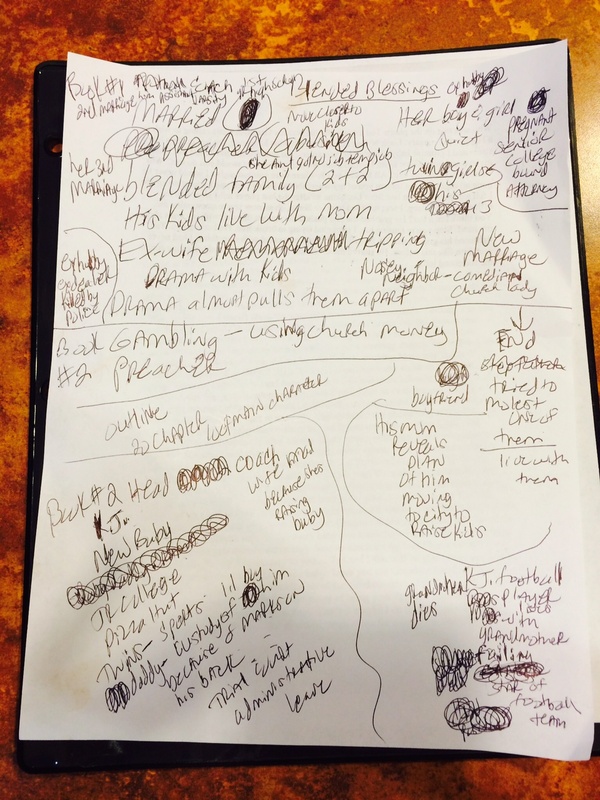 We both ended up writing more here and there as the plot unfolded. 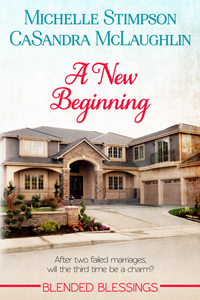 Lo and behold, the first novella in the Blended Blessings series, A New Beginning, was published on February 28. We wrote book 2 (Through It All) in March and sent it to the editor yesterday (April 4). We met last week to plan book 3, which will probably come out in the summer. 1. Co-authoring is much faster than authoring alone. I know it seems like, “duh!” but that self-imposed pressure actually caused me to kick it into high gear. I’m already a “writing rabbit” – but co-authoring makes me a writing rabbit on steroids. 3. Create a chapter outline. Both April and CaSandra were new to writing Christian fiction, so an outline was essential to helping make sure we were going in the right direction. As an experienced fiction writer, I did veer off a few times, but when I did, I went back and changed the outline so I wouldn’t lose my co-author. After that happened a few times, I think both April and CaSandra felt free to change things up as they wrote, too. Writing is art, after all! 4. Be clear about finances. With both authors, we set clear expectations. We went 50/50 on the cost of the book cover (whether contracting or just buying the art), editing, and promotions. We also split royalties 50/50. Once a monthly (usually a day or two after Kindle pays), April and I have lunch. I login to the different publishing platforms and open the reports. She pulls out her calculator, and we view the royalties in real-time together. We do the math. I write her a check for half the royalties and that’s it. At the end of the year, I write off what I paid her (form 1099), she reports it as income on her taxes so I don’t get taxed for both of us. The same will happen when CaSandra and we start to receive royalties. (Woo hoo!) Note: We did order books for a book signing. We split the cost of books, then we split the profits. We’ve decided that after the next signing, we’ll just split the books we have leftover and it’ll be every man for himself with selling the rest from the trunk. It’s just too hard to keep track of every time I sell a book and owe her $4. 5. Co-authoring is a rewarding experience. Up until I wrote with April, I really thought of myself as a loner when it came to art. However, the shared creative experience opened me to the process of mentoring other writers and setting others up for success. I still have my own characters and my own ideas to pursue, but helping someone else give birth to their dreams can be just as exciting. Thanks to them, I’m regaining an appreciation for the awesomeness of this gift He has bestowed upon me. This is very interesting. I’ve always wondered how the co authoring experience works. I’m not sure I’m ready for it yet because I have such a clear vision of how I want the story to unfold. I just completed the manuscript for a children’s book. It was great working with the illustrator (who is my brother in law) because we had clear cut roles….I write the text, give it to him and he creates the illustrations. I gave him a loose discription of what I wanted the main character to look like and he did the rest. The illustrations are amazing and I can’t wait to begin the publishing process. This will be my first children’s book! Whoo Hoo. Krystal – I imagine things are much more cut-and-dry with an illustrator. It is somewhat difficult to give up some of the control as a writer, but I’ve been blessed to be “stretched” by my co-authors 🙂 Best to you with your book! I enjoyed reading this. I wondered how the process worked and you gave a really great explanation. What About Mama’s House was a very good series, of which I enjoyed reading! 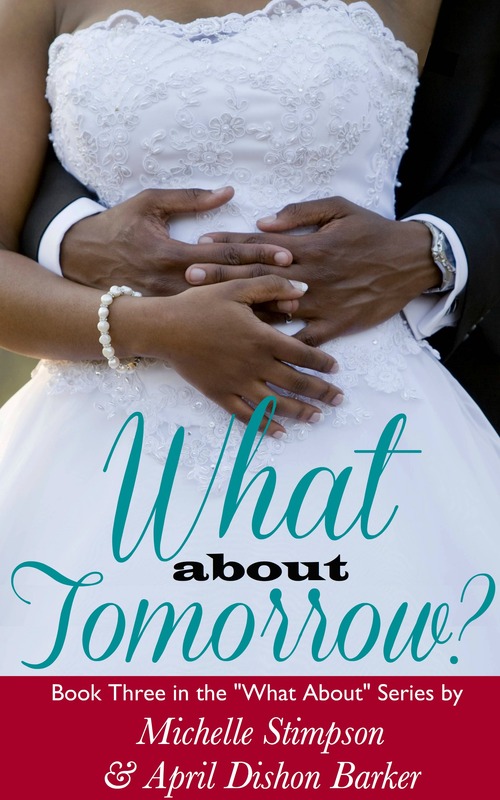 The cover for book two in the “Blended Blessings” series is beautiful! Thanks, Tamara! So glad you’ve enjoyed the books! Miss you, sis! You were the featured speaker during 2010 for the OCBF 6th Grade Girls Tea. We invite you to join the other previous featured speakers for the 10th Anniversary 5th Grade Girls Tea. Unfortunately, the event is this Sunday, May 17, 2015 from 3:00 pm – 5:00 pm. It will be held in the Christian Education Building, 1st Floor Youth Room. I certainly will understand if your schedule absolutely will not allow you to make it. And, I should be beaten for this last minute notice. However, if are in a forgiving mood and would be able to be with us, please let me know. (Ruth L. Burton, solutions_dallas@yahoo.com, 214-728-3794) If you can come a few minutes before 3:00 pm, we would love to take a few photographs. I do believe you will enjoy this afternoon. Yes, yes, we will be dressing up looking like church ladies. Wait, we are church ladies. I’d love to hear from you. Congratulate on your great books. I remain a fan.